Vannacht logeerde onze “leen”-teckel Flip weer bij ons thuis, altijd zo leuk 😃 Hebben jullie een huisdier? En wat is je favoriete huisdier? 😃✌️ Vandaag lekker gewerkt en nu wat laatste dingen aan het voorbereiden voor een nieuwe opnamedag op vrijdag voor #binnenstebuiten #makeover ✌️😃 Wat doe jij vanavond? Happy eve! . Last night stayed in at home out “borrowed” dachshund, every week amd we love her! It was a nice eve! What is your favorite pet? 🐶 Today it was a nice workday and this eve I will do the last things for a new make over for a Dutch tv program next friday ✌️😃 What are your plans for this eve? 😃 Enjoy it! If you’ve ever wondered what it’d be like to sink into a cloud of unadulterated happiness, Michel Ducaroy’s Togo Sofa will get you pretty close. For the past 40 years, the structureless seat has provided a soft landing pad for couch potatoes and homebodies the world over. Love it or hate it, we’re still seeing the pillowy staple in the homes of (just about) every trendsetter we know. Hailing from a long line of industrial designers, Ducaroy’s creative upbringing is likely to blame for his unique approach to silhouettes. Known for its slouched shape and quilted polyester upholstery, the seat is as fun as its name suggests. The French designer created the first Togo Sofa back in 1973, according to Ligne Roset—the luxury furniture brand that has sold Ducaroy’s famous foam-filled seat since its original conception. Not unlike Gae Aulenti’s Jumbo Coffee Table or Noguchi’s Akari Lamp, the Togo Sofa has reached full icon status. Available in a range of sizes and colors, the seat’s almost comical form lends a sense of ease and whimsy to every room it graces. Just take a look for yourself. Good morning Saturday ✨✌️ Gisteren een gezellige avond gehad in Leiden met vrienden 😃 En straksjes ons koffertje pakken voor Italië en ons huisje opruimen voor logees die komen 😃 Gaan jullie dit wknd wat leuks doen? ✨ Enjoy!! Talk about the perfect squeeze. Interior blogger and stylist Theo-Bert Pot’s Togo loveseat fits perfectly in the small sitting room off his back patio. Brass accents and muddy greens pick up on the seat’s rich emerald hue, while the artistic addition of an oversize branch lends an Instagrammable touch. If your approach to design includes a “less is more” mentality, repeat after this streamlined room. The only “more” in this strictly minimalist space is a single Toto seat. A sheer absence of furniture and clutter only emphasizes the piece’s quirky shape. Bedding designer Rachel Castle has declared herself a “fun enthusiast,” and now we see why. 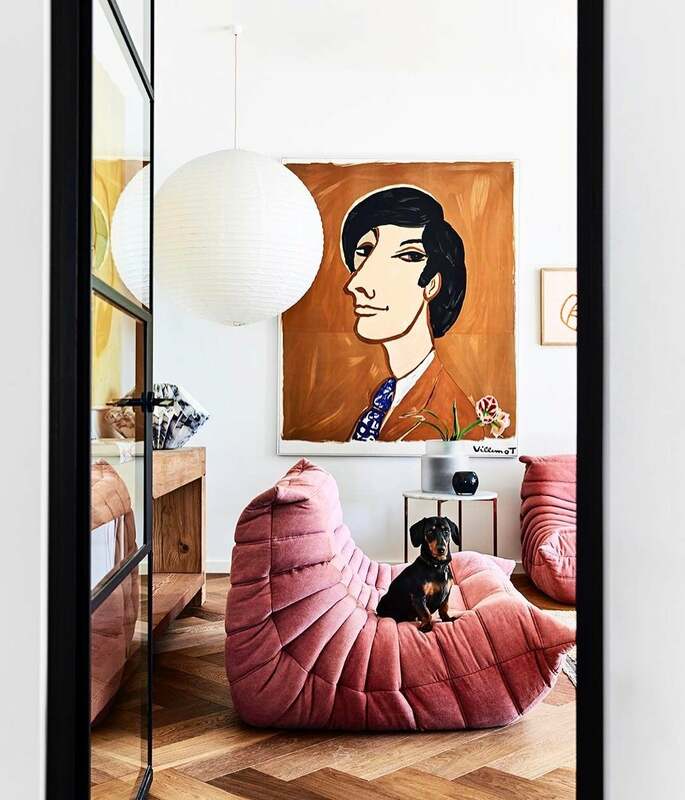 Two rosy pink Togo sofas make an appearance in her art-filled home in North Sydney, Australia—the perfect perch for her adorable dog, Syd. This house was #midcenturymodern but extremely #outdated. Every one (including me!!) thought I was going to #paint the #paneling #white. But it was just so darn beautiful, I didn’t have the heart to. SO I made EVERYTHING else white. The #brick, the #cabinets, the #ceiling, the #furniture… By mixing in high gloss on ceiling, kitchen, and other spots, and by adding a #simple #linear #lightingfixture, we kept an ode and respect to the #home’s era, but made the space feel #modern, #fresh and #inviting. // #LeanneFordInteriors shot by @alexandraribar for #HGTV’s @restoredbythefords. Season one coming Jan 2. Lover of all things crisp and white, we can’t say we were too surprised to learn that Leanne Ford is as obsessed with this chair choice as we ware. With only one Togo to work with, the HGTV star balanced the living room arrangement with a classic, full-size sofa on one side of the room and a heavy marble side table on the other. Parisian interior decorator Darya Kopp admits that her nook-like Togo has become a place of respite for her cat. With no shortage of natural sunlight, we wouldn’t mind curling up in this blush corner either. The nearby bookshelf is just waiting to be rummaged for a new read. Get in on this timeless living room trend with our favorite picks below. There’s a reason we love L-shaped sofas: they’re practical, great for big families, and act as a natural divider for open-concept spaces. Take your sectional to the next level with this burnt orange number that’s taking us right back to 1973. Calling all design lovers in the making: This mini Togo chair lets kids get in on the action too. Take a cue from Ford and complete a whitewashed room with this sleek statement seat, which can act as an impromptu sleeper sofa when guests spend the night. Want to embrace the whole gang? This three-piece set comes in the most amazing shade of pink.